At the nexus of high finance and sophisticated computer programming, a terrifying future may be unfolding even now. Dr. Alex Hoffmann’s name is carefully guarded from the general public, but within the secretive inner circles of the ultrarich he is a legend. He has developed a revolutionary form of artificial intelligence that predicts movements in the financial markets with uncanny accuracy. His hedge fund, based in Geneva, makes billions. But one morning before dawn, a sinister intruder breaches the elaborate security of his lakeside mansion, and so begins a waking nightmare of paranoia and violence as Hoffmann attempts, with increasing desperation, to discover who is trying to destroy him. 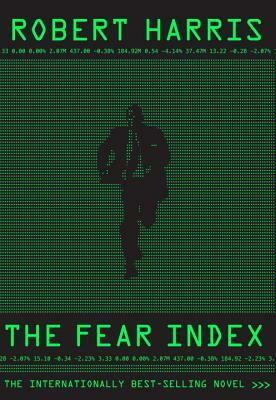 Fiendishly smart and suspenseful, The Fear Index gives us a searing glimpse into an all-too-recognizable world of greed and panic. It is a novel that forces us to confront the question of what it means to be human—and it is Robert Harris’s most spellbinding and audacious novel to date. Robert Harris's previous books include "Fatherland, Enigma, Archangel, Pompeii, Imperium, Conspirata, " and "The Ghost Writer" (originally published as "The Ghost"). His work has been translated into thirty-seven languages, and he is a Fellow of the Royal Society of Literature. He has been a television correspondent for the BBC, political editor of "The Observer, " and a columnist for "The Sunday Times" and "The Daily Telegraph." He lives in a village near Hungerford in Berkshire, England.